The M020340R 3/4'' X 4'' Red Clearance Marker has a 100,000 hour rated LED life on a power draw of only 40 Milliamps. The M020340RCL 3/4" X 4" Red Clearance Marker fits Railes and mounts with standard 3" mounting holes. The M020340R 3/4'' X 4'' Amber Clearance Marker has a 100,000 hour rated LED life on a power draw of only 40 Milliamps. The new M09300 series comes with an attached grommet for quick mounting. 3 SMD LEDs Provide superior light output. Tthe new M09370 series is the perfect auxiliary strobe for emergency, warning and safety applications. Each strobe comes complete with control module, stainless steel bezel & grommet. 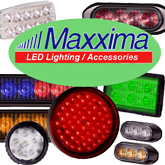 Maxxima introduces a new series of Warning Strobes, the M20373. 4 LED strobes have increased diode output, enhanced lens and reflector design used for emergency, warning and safety. The M20375 WYCL is an Amber/White Split Flash Stobe which offers both White and Amber functionality in the same light.